[ALL planets ever discovered have been orbiting stars. This is the first planet ever discovered that’s just floating around in space. The term "rogue” is probably due to the scientists’ thinking that this planet presents a threat. Since it’s floating around (no doubt moving at a certain speed), it could one day perhaps smash into a star or even move through a star’s solar system either destroying planets, smashing into them or causing some kind of chaos during its passage. But you must remember that space is enormous and that the planet might be able to move around for billions of years without even encountering anything. So this is the first time ever that scientists discovered a planet all by itself. It is astounding that they could detect an object so small 20 light years away! The ability of astronomers to now detect even small objects at incredible distances is truly very impressive. So no aliens can “sneak up on us” without us knowing!!! Recently scientists detected the first object to enter and leave our solar system from beyond it … and that meteor was not big. That was also a first. Below is an artist’s impression of what this strange planet looks like close up based on what scientists know. Note the aurora. Take special note at the bottom of the article, the mention that the planet would have an aurora due to its magnetic field. This is very important. The topic of planets with powerful magnetic fields is very important. NB: The topic of planetary magnetic fields is one which interested me a LOT in the past. I became convinced that this could be a sign of nuclear activity deep down in the planet’s core. Later I published many papers by the nuclear scientist Dr Marvin Herndon wherein he showed that naturally occurring nuclear reactions were probably causing all of the Earth’s magnetic field and the magnetic fields of other planets like Jupiter, which is a gaseous giant, which has a strong magnetic field. Herndon published scientific papers which showed that a nuclear fission reaction 16 miles across at the center of the Earth would cause ALL the things that we associate with the planet’s magnetic field. The magnetic field fluctuates, and changes and moves. This is consistent with a nuclear reaction as various “nuclear poisons” affect the reaction. This magnetic field then causes solar particles to flow in a direction more or less around the magnetic poles. This causes the aurora. Scientists do not know what causes the magnetic field of the earth or other planets. In the case of the earth they attribute it to slow “churning” of heavy materials inside the Earth’s core which acts like a generator. However, magnetic fields are also a natural result of all forms of nuclear reaction including fission (very heavy metals like uranium and plutonium) and fusion (very light matter like in the sun and other stars). Nuclear bomb explosions cause powerful magnetic fields. These are known as EMP’s electro magnetic pulses. EMPs can destroy computers and electronic equipment. Dr Herndon is the only scientist I came across who wrote papers on naturally occuring nuclear reactions inside planets like the Earth and inside Jupiter and gaseous planets. However, in my research I knew that from the 1940s, nuclear scientists already knew that naturally occuring nuclear reactions were possible. The French discovered a place on the surface of the Earth in West Africa where a naturally occuring nuclear reaction had run. Nuclear reactions deep down or at the centre of planets is much more likely. The conditions there are even better for nuclear reactions. Herndon did various calculations about this and had it published in some scientific journals. I suspect that scientists know a stack more, but that it is Top Secret and that most nuclear research is military. I suspect they know a LOT that is kept from the public. Herndon did work on how nuclear reactions could kick start stars, but also how non-stars (i.e planets of rock or gas) could still have nuclear reactions. Jupiter and Saturn for example generate more heat than they receive from the sun. They generate twice as much heat as they receive. So a nuclear reaction is a possibility. Jupiter is amazingly hot for an object so far from the sun. In my view, nuclear reactions inside planets is a critical topic. In the story below, they talk of the very powerful magnetic fields that they’ve detecting around this planet. This planet is massive and is border-line a “failed star” meaning that its nuclear reaction did not light it up properly. But just because the planet does not shine like a star, does not mean there is no nuclear reaction. Its just that the nuclear reaction may be hidden right at the core of the planet and the only outward manifestations of its existence is the magnetic field! A planet over 12 times more massive than Jupiter has been found drifting alone through space around 20 light years away from Earth. The ‘rogue’ object is not attached to any star, and is the first of its kind to be discovered using a radio telescope from Earth. 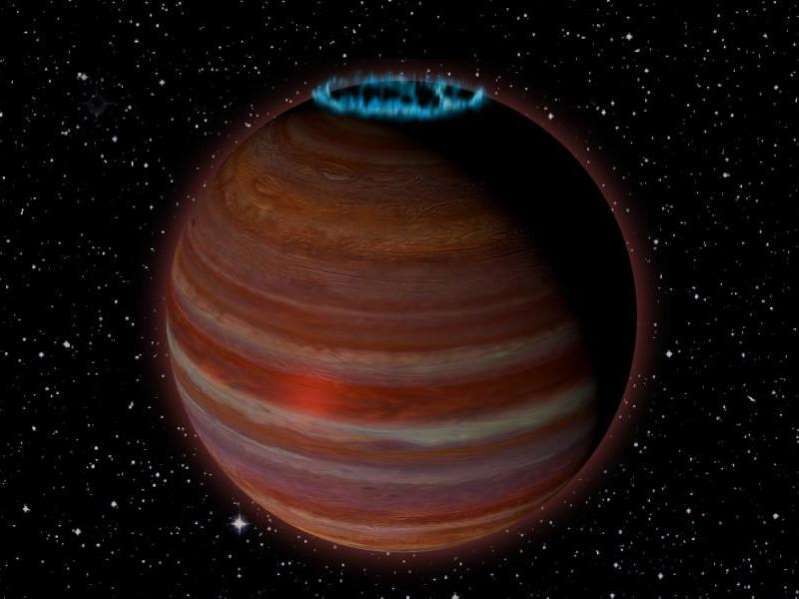 “This object is right at the boundary between a planet and a brown dwarf, or ‘failed star,’ and is giving us some surprises that can potentially help us understand magnetic processes on both stars and planets,” said Dr Melodie Kao, an astronomer at Arizona State University. Brown dwarves are difficult objects to categorise – they are both too huge to be considered planets and not big enough to be considered stars. Much still remains unknown about these astronomical bodies – with the first one only observed in 1995 – and the scientists behind the discovery were trying to understand more about the magnetic fields and radio emissions of five brown dwarves. However, when another team looked at the brown dwarf data they realised one of the objects, dubbed SIMP J01365663+0933473, was far younger than the others. The boundary often used to distinguish a massive gas giant plant from a brown dwarf is the “deuterium-burning limit” – the mass below which the element deuterium stops being fused in the objects core. This limit is around 13 Jupiter masses, so at 12.7 the newly identified planet was brushing right up against it. As this was being established, Dr Kao had been conducting measurements of this distant object’s magnetic field – the first such measurements for a planetary mass object outside our solar system. “When it was announced that SIMP J01365663+0933473 had a mass near the deuterium-burning limit, I had just finished analysing its newest VLA data,” she said. Similar to the aurora borealis or Northern Lights seen on Earth, this planet and some brown dwarves are known to have auroras of their own – despite lacking the solar winds that are known to drive them. “This particular object is exciting because studying its magnetic dynamo mechanisms can give us new insights on how the same type of mechanisms can operate in extrasolar planets – planets beyond our solar system,” explained Dr Kao. sorry Jan but the earth is not what the jews says it is.guilty until proven inocent.eric dubay explains this jewish bulllllllshit nicely.thank you for all your work. (of an animal) having an abnormally savage or unpredictable disposition, as a rogue elephant. it literally means it dosnt follow the normal path, which this planet does. usually planets are formed in solar systems where the gravity first forms a sun then the suns gravity forms the planets, i have not read up about this planet yet but i assume its probably more like a large asteroid, quite possibly formed by the collision of many asteroids. FANTASTIC NEWS: Signs popping up everywhere: Its OK to be German! VERY IMPORTANT: The Russian Govt blocked the world’s most secure phone chat service: Telegram!! – Mass PROTEST!